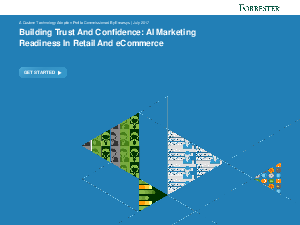 Forrester Study: Distilling AI Hype from Tangible AI - AI Marketing Readiness in Retail & E-Commerce. Emarsys commissioned Forrester Consulting to conduct a survey of 717 retail and e-commerce business decision makers to understand the objectives they want to achieve by investing in AI initiatives, and the challenges they face when executing AI strategies. Five objectives businesses want to achieve by investing in AI technology. Five challenges marketers face when executing AI marketing strategy. How organizations are using AI marketing technology to drive innovation and create growth.